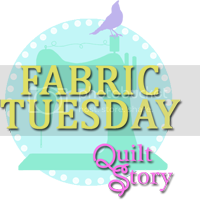 Sunshine Through the Rain: The quilt that drove me crazy! A commissioned quilt, my first one. Sounded good in theory, even though it involved t-shirts, baby clothes and school uniforms! 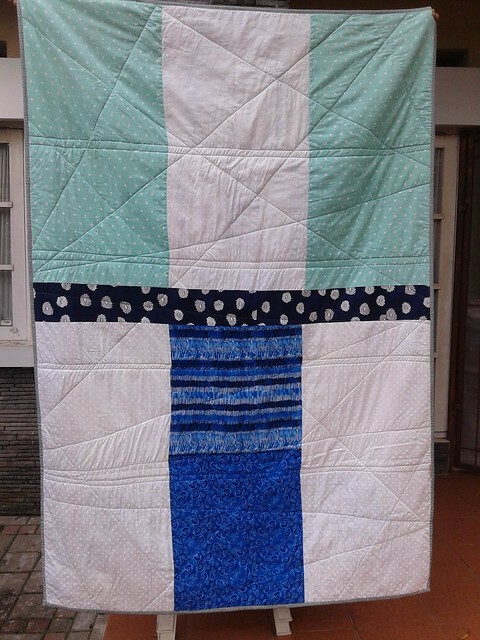 In practice, this was probably the most difficult quilt I have ever made! The friend who ordered it (for her daughter) said she didn't mind about the style, but it needed to include a killer whale, blue flowers and be roughly lap-sized! I sat looking at the clothes for months, and realised that there weren't enough to just make a standard t-shirt quilt. This actually provided an easy road to get started - I made some 12 inch patchwork blocks to incorporate into the quilt. I had won some gorgeous blue-flowered fabric (True Blue by P&B Textiles) from the lovely Susan, and Jodi (one of my favourite bloggers) had started posting weekly tutorials for a quilt-a-long of her favourite patchwork blocks, so I chose 4 of those to make. That was the easy part done! To avoid the t-shirts for a little longer I then got to work on the Killer Whale. I found a paper-pieced pattern, and after 2 days solid work was so pleased with the outcome! In fact I was so pleased that I decided to paper piece a tardis too, seeing as the recipient is a huge Dr. Who fan! With a bit of help from my instagram friends I worked out that I needed to make each item of clothing up to the same size as the patchwork and paper-pieced blocks that I had made. And so I finally got cutting, and interfacing (I just used light-weight cheap interfacing and it worked a treat! ), and sewing until I had each item of clothing represented in some way. For some t-shirts I was able to cut out the picture and just leave that as a whole block. For others I needed to cut out the logos and frame with fabric borders, or cut two logos and then stitch them into the same block. After adding sashing and borders, the quilt top was complete and I breathed a huge sigh of relief! Little did I know that quilting this was going to be the most difficult part of the process. I tried FMQ (but just couldn't get the quilt to move smoothly) and straight horizontal lines (that ended up uneven and pulled the fabric). After ripping all that out I decided to go with randomly placed straight lines, and set up my table so that the quilt was as well supported as possible. I think the weight of the quilt (with the different types of fabric and the interfacing) caused too much drag and really made quilting this difficult. But it worked out in the end - phew! I pieced a back together from the left-over fabric that I had and used some navy stripes for the binding. Once I started working on this quilt properly, nearly 2.5 months ago, I promised myself I wouldn't make anything else until I had finished! 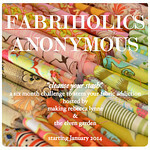 I apologise for the lack of blog posts, but am looking forward to getting back to creating now! Well done Deborah! I've done one for a friend previously with baby clothes... cripes it was something else to I am feeling you on this one! Though you have done an amazing job and it looks fantastic despite the difficulties! I am sure your friend and her daughter are wrapped! Congrats!! 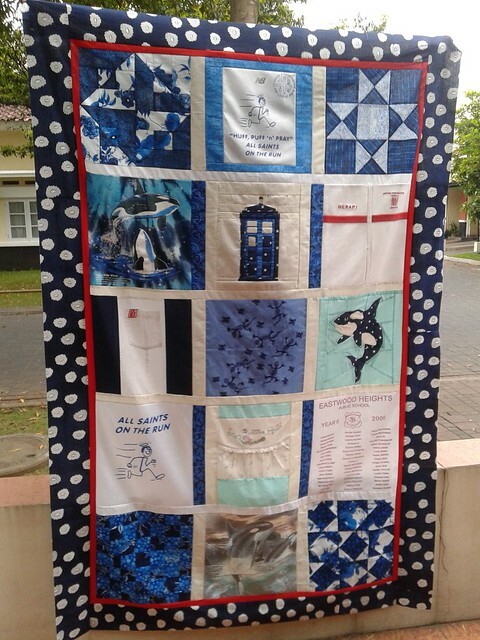 So clever and I love the whale and tardis!! I completely understand the thing about not being able to reward yourself with any other project until this was out of the way! It was obviously such a tricky quilt to ponder and make so I bet you are heaving a huge sigh of relief but they must be so delighted with the lovely result. Oh my goodness. Just the brief had me shaking in my socks - baby clothes, T-shirts and killer whales!? Yikes! You totally nailed the whales. What a great quilt!! I bet the recipient loves it to bits.That killer whale is amazing. I don't know what I would have done if someone said I had to include a killer whale. 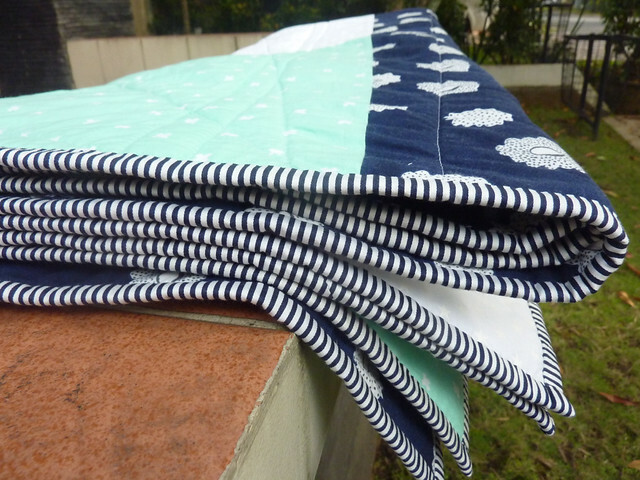 Some quilts are there to challenge, I hope your next project comes together like a breeze. 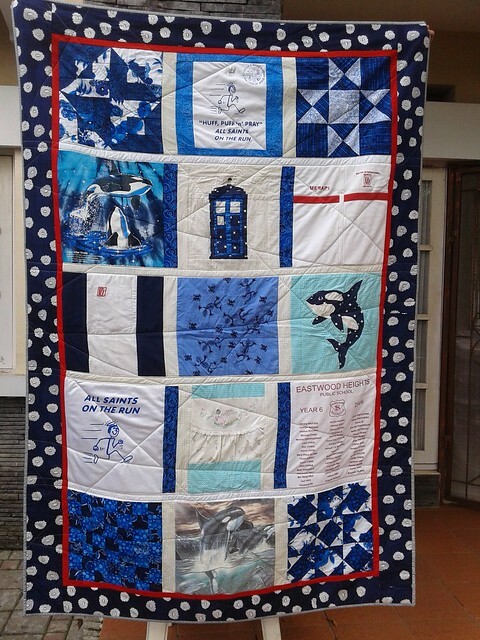 Deb, you have done an amazing job with this quilt! I would never have contemplated making a quilt with t-shirts! 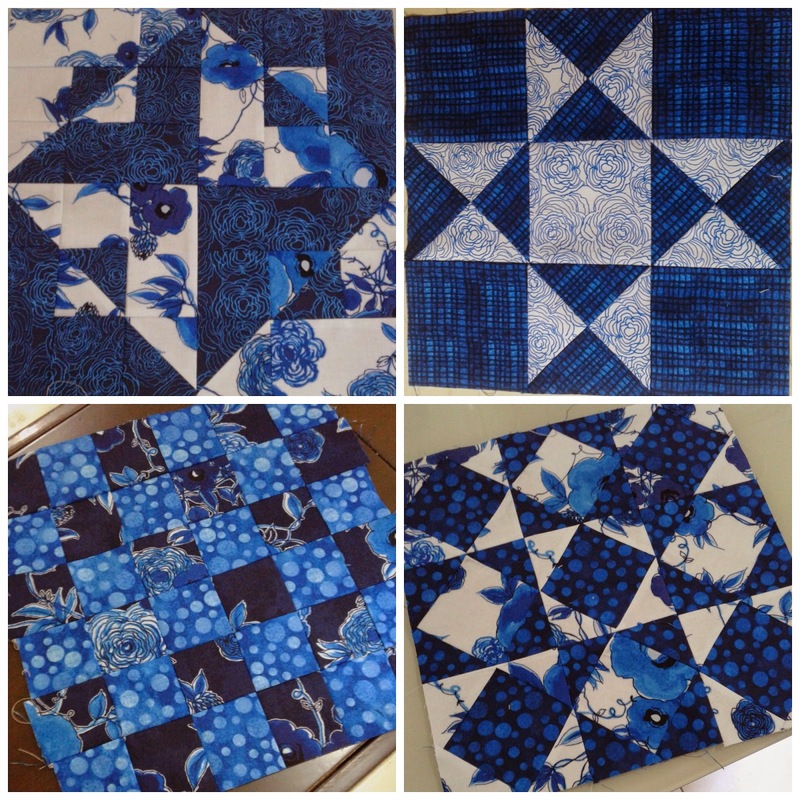 Your foundation paper piecing is incredible too! I hope the recipient appreciates the efforts you went to! 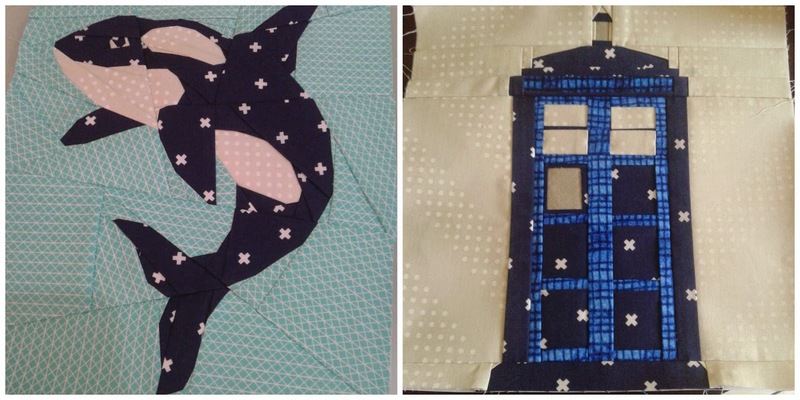 That Tardis block is one I'm making for my niece too. Your quilt turned out so pretty! It really is amazing! Hope it is well loved for many years. The paper pieced whale is stunning! What an awesome finish, great job!! Love the paper pieced blocks - works so well as a whole too!